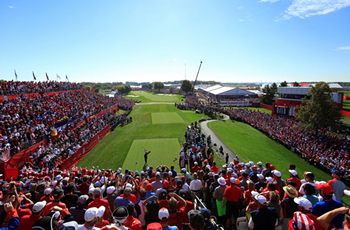 Experience individual days at a Major Championship! Purchase from the individual daily grounds tickets below for access to the Championship grounds for the specific day(s) requested. Saturday and Sunday Grounds Tickets are now SOLD OUT. Juniors 17 years of age or younger receive FREE admission with a ticketed adult. Please read below for complete details on our junior and military admission policies. 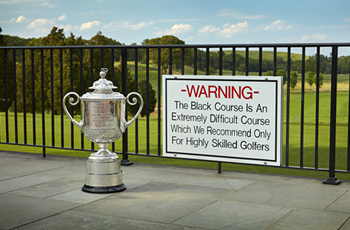 Elevate your experience at the 101st PGA Championship with a premium ticket package for the Wanamaker Club presented by Michelob ULTRA at Bethpage Black. The Wanamaker Club presented by Michelob ULTRA is a climate-controlled venue located right of Hole 1, featuring a sports bar atmosphere, upgraded food & beverage selections for purchase, executive restrooms, flat screen televisions and JumboTrons, and a large patio overlooking the 1st Fairway and Green. 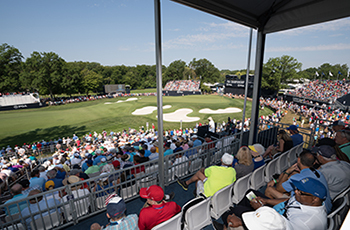 Each Wanamaker Club Ticket Package provides access to the Championship grounds and Wanamaker Club at Bethpage State Park for all seven days. Please read below for details on our junior and military admission policies. Each Wanamaker Club Ticket Package comes in the form of seven individual daily tickets (one for Monday, one for Tuesday, through Championship Sunday). Secure your place at the biggest golf event in New York history… the 2024 Ryder Cup! 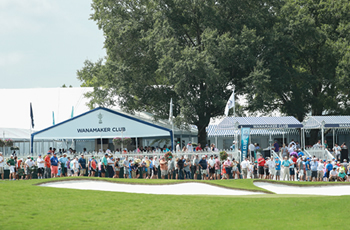 The Ultimate Wanamaker Club Ticket Package includes four (4) week-long Wanamaker Club presented by Michelob ULTRA ticket packages for the 2019 PGA Championship and reserves access to the 2024 Ryder Cup when it comes to Bethpage State Park. Each purchaser will be guaranteed an opportunity to bypass the Ryder Cup random draw process and purchase two (2) week-long grounds passes. As golf’s most compelling team event, demand for the Ryder Cup has far exceeded what can be accommodated. In an effort to provide the fairest opportunity to all fans, tickets to the Ryder Cup are sold exclusively through a random draw. The Ultimate Wanamaker Club Package will be the ONLY way to guarantee access to a 2024 Ryder Cup ticket purchase. From the first practice round to the final putt, experience week-long access to the PGA Championship—perfect for golf fans! Season Grounds Ticket Packages are now SOLD OUT. As part of the Championship’s mission to grow interest and participation in the game of golf, juniors 17 years of age and younger will be admitted into the Championship grounds for FREE when accompanied by a ticketed adult. Each ticketed adult will be permitted four junior grounds admissions per day at no additional charge. Junior tickets may be picked up on-site at the Admissions Office located at the Main Spectator Entrance on the day of admission. Junior tickets cannot be obtained in advance and will be available regardless of a sell-out. Please note, junior tickets do not gain access into private hospitality areas or into the Wanamaker Club presented by Michelob ULTRA at Bethpage State Park. A nominal daily upgrade charge will apply for youth access to the Wanamaker Club. Junior upgrades can be purchased on the day of attendance at the Admission office located at the main entrance of the Championship. To honor the men and women who serve our country in the Armed Forces, the Championship is pleased to offer Active Duty, Retirees*, Reserve, National Guard and their accompanying guest (limit one) complimentary daily grounds access to the Championship, regardless of sell-out. Upon arrival, Military personnel must go to the Admissions Office at the Main Spectator Entrance to present their Military ID in exchange for daily admission. Please note, these tickets cannot be upgraded to alternative venues, but are eligible for the junior admission policy. *Career-retired with twenty years of qualifying military service and Department of Defense ID. There will be no daily re-admission to the grounds of Bethpage State Park. If you leave the grounds, you must have an unscanned ticket to return to the PGA Championship. Once the bottom of the ticket has been scanned, it will no longer provide admission to the Championship. The only exception is when the Weather Warning signs have been posted. Please wear your ticket in plain view at all times as security personnel will not allow admission to the Championship for individuals without appropriate credentials. For any ticketing questions or to order tickets by phone during your purchase window, please call (800) PGA-GOLF (742-4653), Mon. - Fri., 8:00a.m. - 5:00p.m. ET.